Architectural evidence suggests that there was a church on this site at least from the 8th century. However, it may have had a longer history. 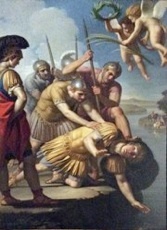 According to one version of the legend of Str Secundus (BHL 7558), a lady called Eudoxia arranged for the burial outside Gubbio of the martyr St Secundus, who had been martyred in Amelia in the reign of the Emperor Diocletian. Local tradition assigns her to the Gabrielli family and credits her with the building of the original church of San Secondo here. The church added to its store of relics when it acquired those of SS Secundinus and Agapitus, who were probably Christians fleeing the Vandal invasion of Africa in ca. 500. Their presence in the church accounts for the fact that Pope Innocent II referred to it as SS Agapio e Secondino in 1142. In 1285, the presumed head of St Secundus and the bodies of St Agapitus and one of the female martyrs among his companions (traditionally St Justina) were handed over to the Augustinians of the nearby town of Pergola, which the Gubbians had founded. 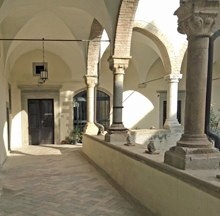 St Ubaldus studied at San Secondo as a child in the late 12th century, and retained fond memories of his time there. As bishop, in 1140, St Ubaldus transferred a vineyard to the community here. This seems to have generated enough income to support a fully fledged canonical community: in 1142, Innocent II granted the request from Leto, the rector of SS Agapio e Secondino (see above), that his community should follow the rule of the Augustinian Canons. The canons had a hospital next to the church until 1169, when it was moved to a site outside the city walls. 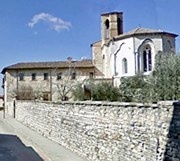 The canonical community here was in decline by the early 15th century, and in 1413 the anti-pope John XXIII approved its merger with that of Sant’ Ambrogio. Pope Callistus III approved this and incorporated the community into the Canonical Congregation of San Salvatore of Bologna. The community was suppressed in 1810 but was able to return five years later. It joined the Regular Order of Lateran Canons at about this time. The nearby church Santa Maria del Ponte became a parish church in 1983 and is administered by the Lateran Canons of San Secondo. The present church dates essentially to the 14th century. It has a fine polygonal apse, although the trilobe arches on its exterior walls were added in the 18th century. The Chiostro dei Canonici (15th century) contains columns of varying designs that might have come from a Roman temple. There is a small cemetery beyond it. 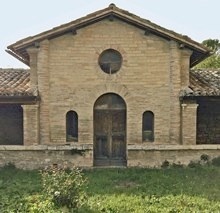 This funerary chapel near the cemetery behind the church belonged to the Pamphili family. 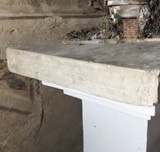 This altar in the Cappella di San Sebastiano, which came from the Abbazia di San Donato di Polpiano, is signed by “Giovanni the Presbiter” and dated by inscription. Some of its decorative elements date to the 7th or 8th century. ✴the flagellation (not illustrated), martyrdom (two details of which are to the left, above) and burial of St Sebastian. 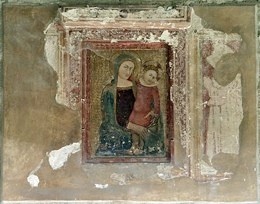 This fresco depicts the Madonna and Child enthroned, with a now-ruined saint to the left and St Vincent (identified by inscription) to the right. 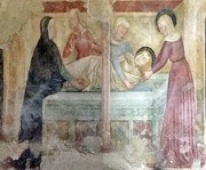 This small fresco, which is attributed to Ottaviano Nelli , was detached in 1904 from the cell of the Blessed Arcangelo in Sant’ Ambrogio. The interior (with the exception of the Gothic high altar - see below) was remodelled in the Baroque style in 1712. An inscription records that the organ (1879) is by “ARTIFICE MORETTINI PERUSIÆ: more specifically, it is by Nicolò Morettini. It records the presence here of relics of SS Secundinus and Agapitus and of St Secundus. These fragments in the apse, which were detached from the triumphal arch in 1993/4, seem to have come from a fresco of the Last Judgement. They are attributed to the Maestro Espressionista di Santa Chiara. 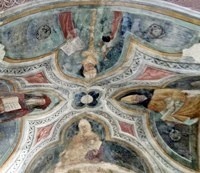 This fresco on the 2nd altar on the left is attributed alternatively to Bernardino di Nanni dell’ Eugenia or Orlando Merlini. The angels to the sides of the Virgin, which were added in the 18th century, are attributed to Giacinto Boccanera. According to Giovan Battista Fidanza (referenced below, at pp. 115-6), a payment for this altarpiece on the 1st altar on the left was made in 1709 to Padre Romito Carlo Mecconi: this artist from Lucca belonged to the eremetic community of Sant’ Ambrogio at Gubbio for the last forty years of his life, which ended in ca. 1744. The altarpiece depicts the Madonna and Child with SS Ubaldus, Antony of Padua and John the Baptist. A restoration of 2000-1 revealed that it was almost totally repainted: the original was detected by radiography and was apparently in a good state of preservation. The figure of St Antony had been faithfully reproduced but the rest of the composition had been adjusted to increase the overall size of the work. Fidanza reported the opinion of the restorer (Roberta Tironzelli) that this overpainting was probably at the time that the altarpiece was moved to its current location, possibly by Giuseppe Reposati. This altarpiece on the 3rd altar on the left was painted in Rome by Giuseppe Reposati. 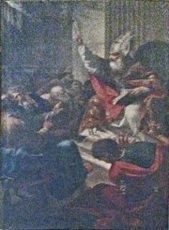 It depicts the Blessed Arcangelo refusing an offer by Giuliano de’ Medici of the post of Archbishop of Florence. ✴six Augustinian saints (SS Aquilinus, Galasius, Fredianus, Stefano Agazzari from Nicola Bonvicini, in oval frames above the side altars. This panel by/attributed to Giovanni Battista Michelini, il Folignate is in the sacristy. This small fresco is now in the Cappella di san Sebastiano, as described above. 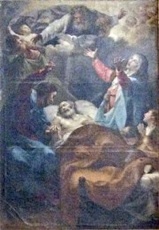 This altarpiece, which is signed by Benedetto Nucci and dated by inscription, was stolen in 1984 from Sant’ Ambrogio. It was moved [where??] to San Secondo after its recovery in 1989. It depicts St Ambrose christening St Augustine, whose mother, St Monica, kneels on the left. The kneeling figure on the right is probably the Blessed Arcangelo Canetoli. Five documented figures that were carved by Giacomo Maffei for the pulpit in the refectory no longer survive. Return to Monuments of Gubbio.